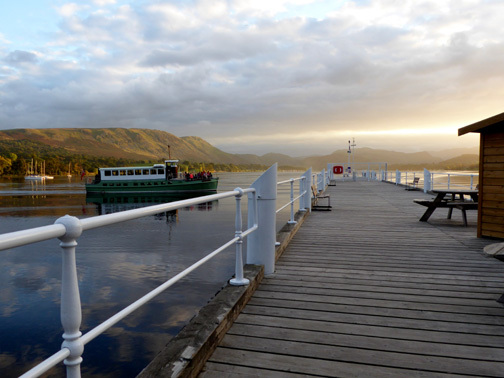 " Pikeawassa and a Ullswater at Sunset "
Date & start time: Saturday 8th October 2016, 2.40 pm start. 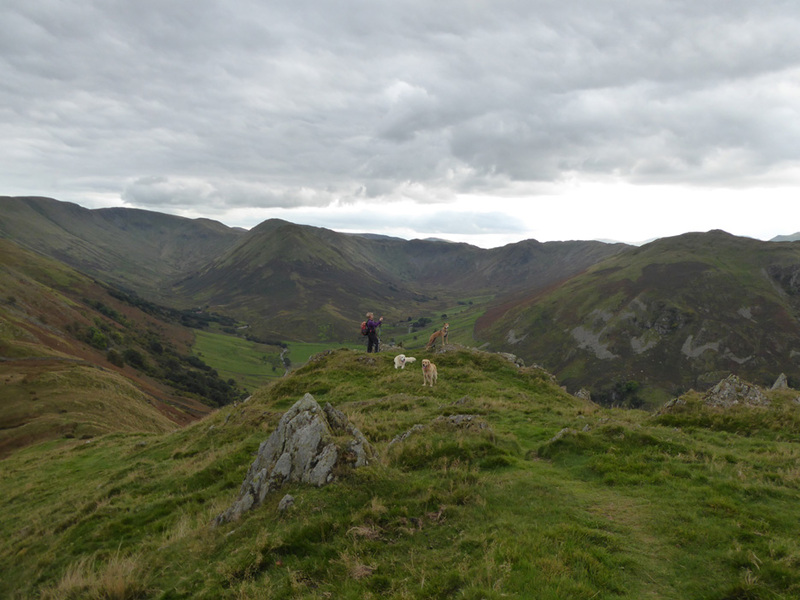 Places visited : Martindale Church, Birkie Knott, Steel Knotts, Steel End and back. 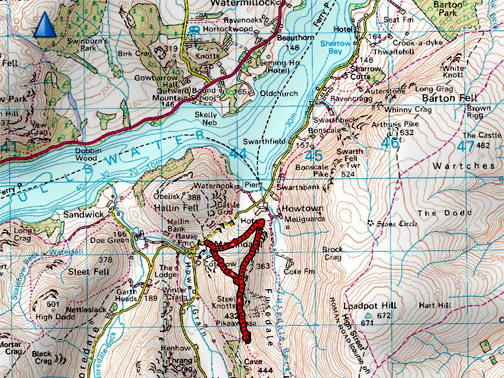 Walk details : 3 mls, 1100 feet of ascent, 2 hour 50 mins. 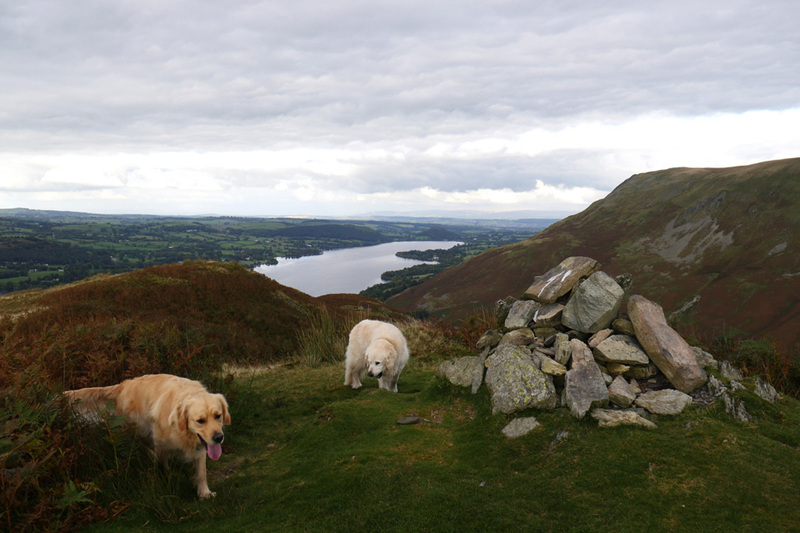 Highest point : Steel Knotts, Pikeawassa, 1,414ft - 432m. 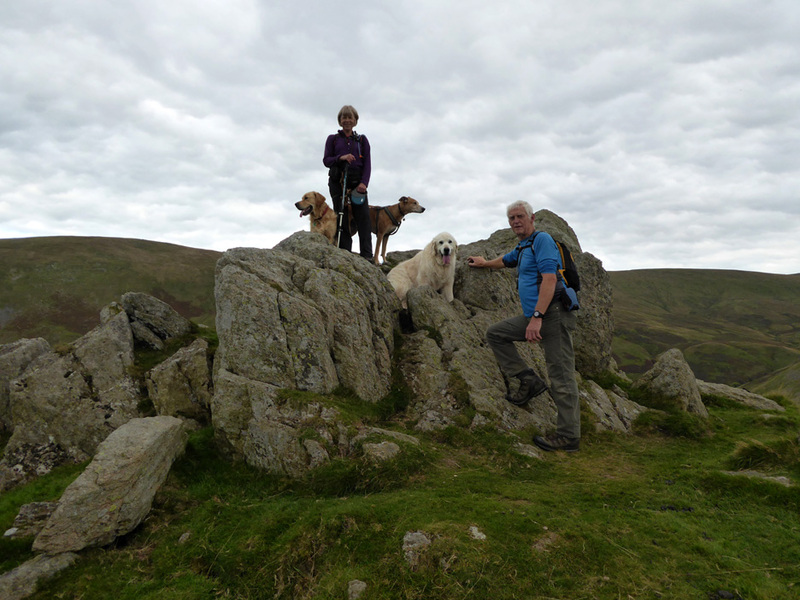 Walked with : Jo, Ann and our dogs, Amber, Harry and Dylan. 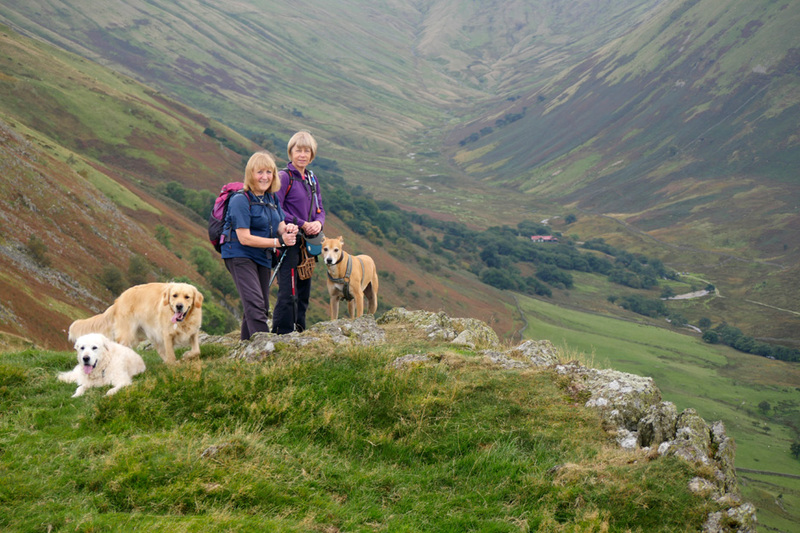 Weather : Sunny and dry but a thick cloud bank crosses overhead as we walk. 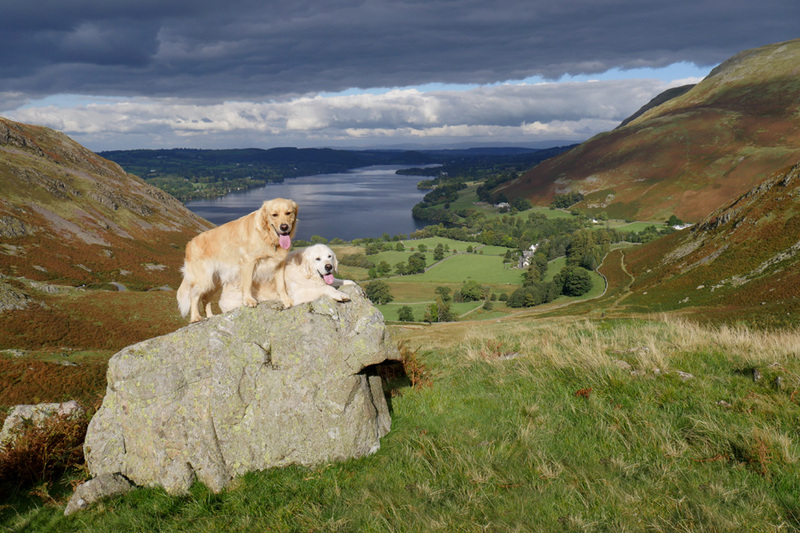 Over to Ullswater today to to meet up with Jo and have a walk in her area. and we haven't been over here for a while, so it will make a nice change. in order to drive around to Howtown for our walk. 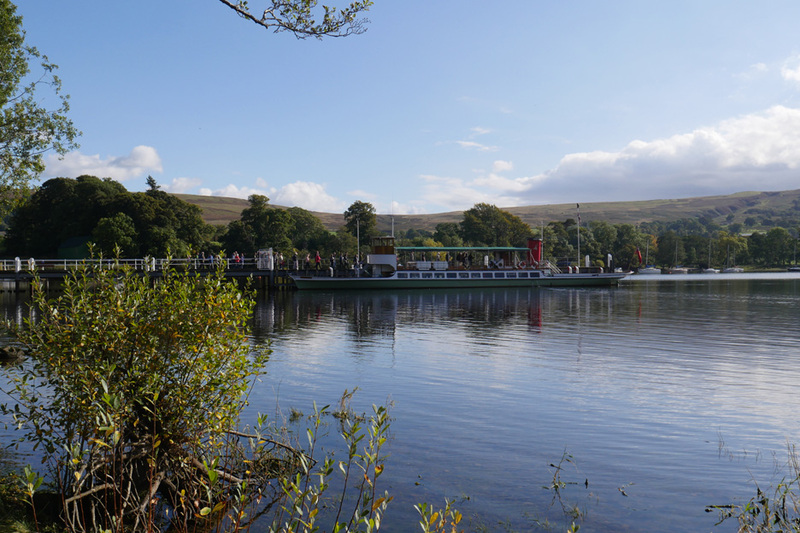 Here the "Lady of the Lake" is alongside the pier and is taking on passengers for the next sailing down the lake. 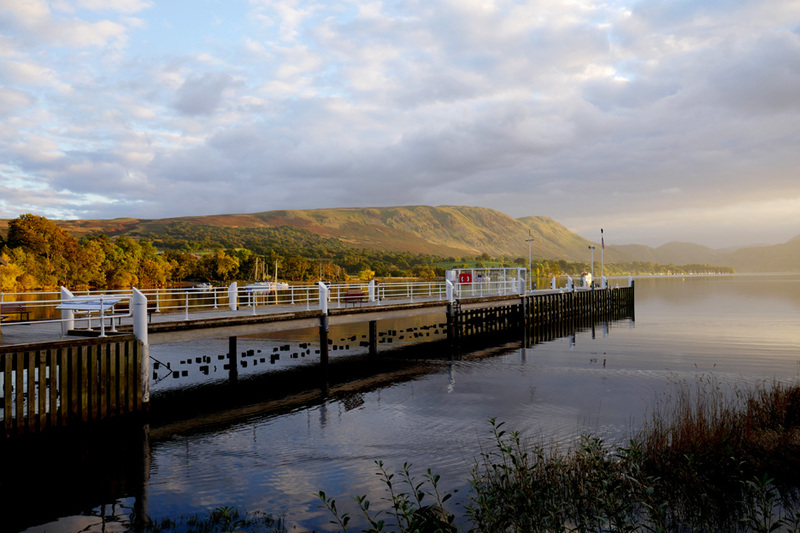 This will be our first visit to 'Pooley' now that it has regained its full name of Pooley Bridge. The stone structure was swept away in the 2015 floods . . . but it has now been replaced and the village is connected once again. 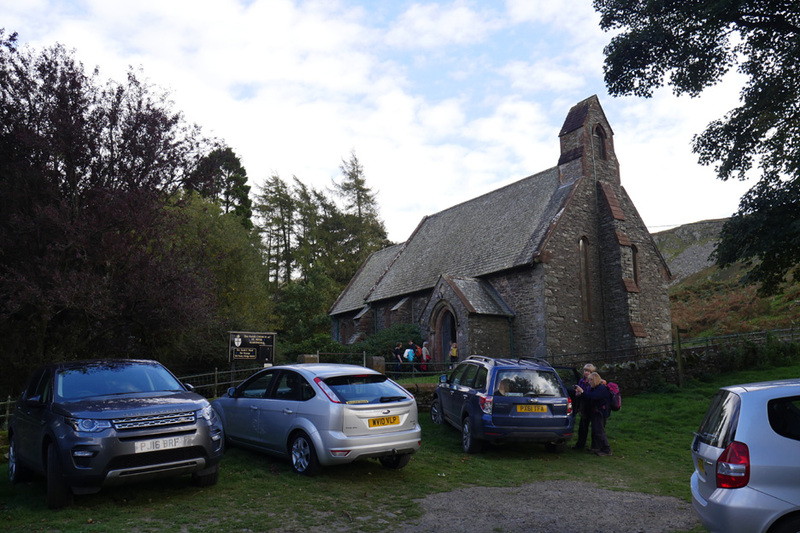 We drove down the southern side of Ullswater and parked in one of the last places at Martindale Church. It was a busy day for visitors two of whom we recognised, Don and Dawn and haven't seen for quite a while. 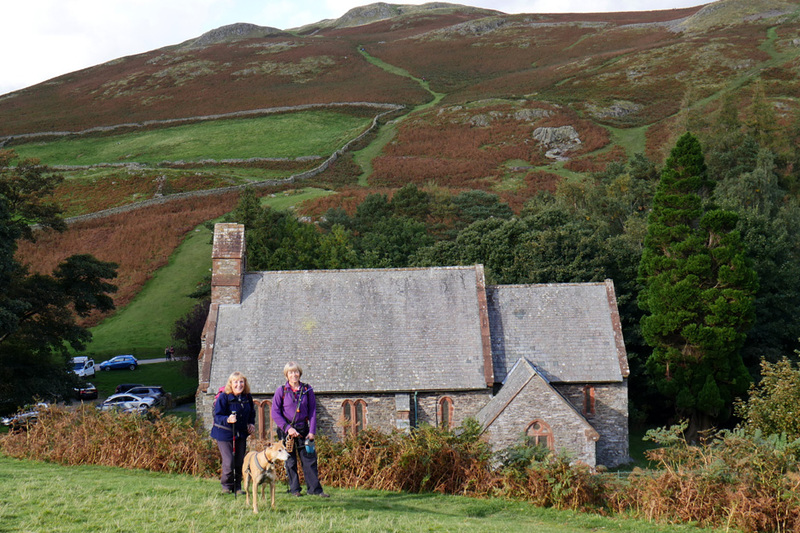 After a short chat we headed up the fell behind the church itself. 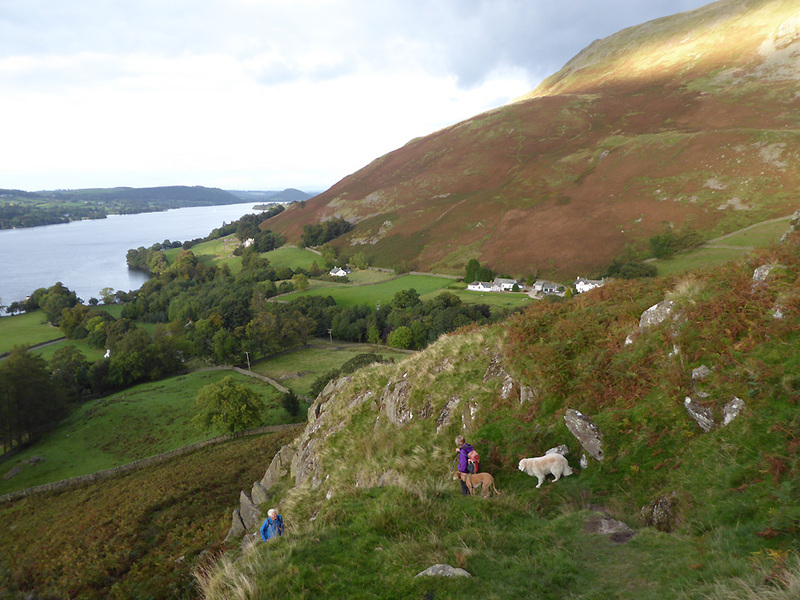 Opposite are the slopes of Hallin Fell which we'll leave for another day. 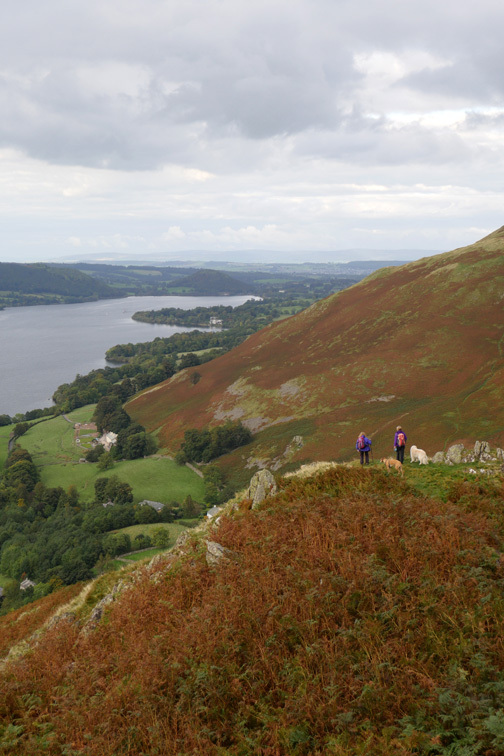 On the top of the first rise (shown on the map as The Coombs) we re-gain our view of the northern end of Ullswater. 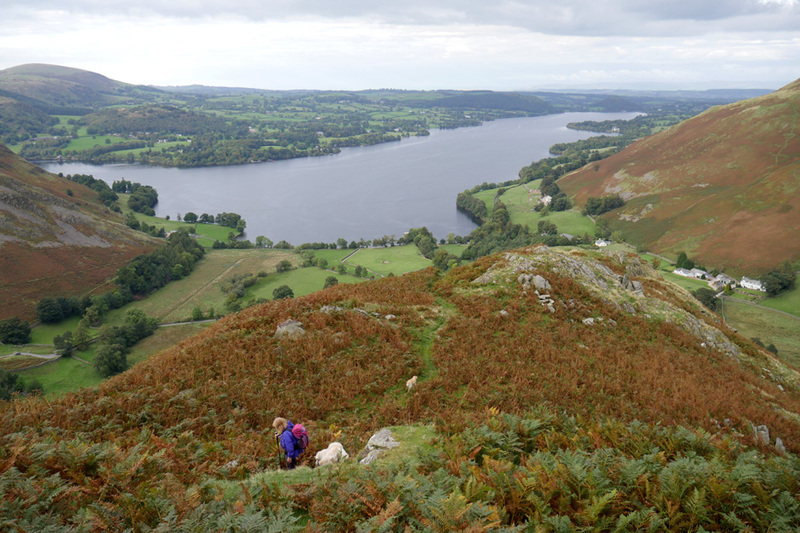 Behind us was Lanty Tarn but we'll pass on seeing that today and continue on, towards the main section of the climb. The weather was beautifully sunny but a heavy bank of dark grey cloud was heading our way. During the walk it would cross right above us, driven by the steady easterly breeze. 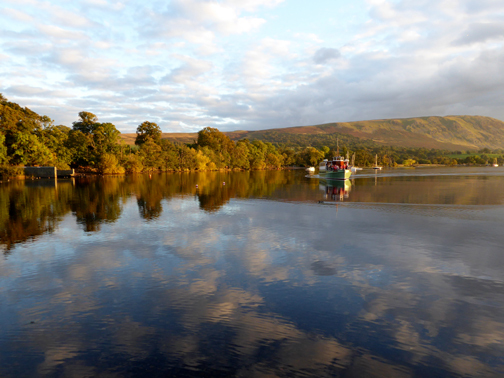 Still, the contrasting light and shade and the intense autumn colours were superb.
" Rock Art " . . . Harry and Dylan style. The only way is up . . . so we go up . . . at quite a steep angle. 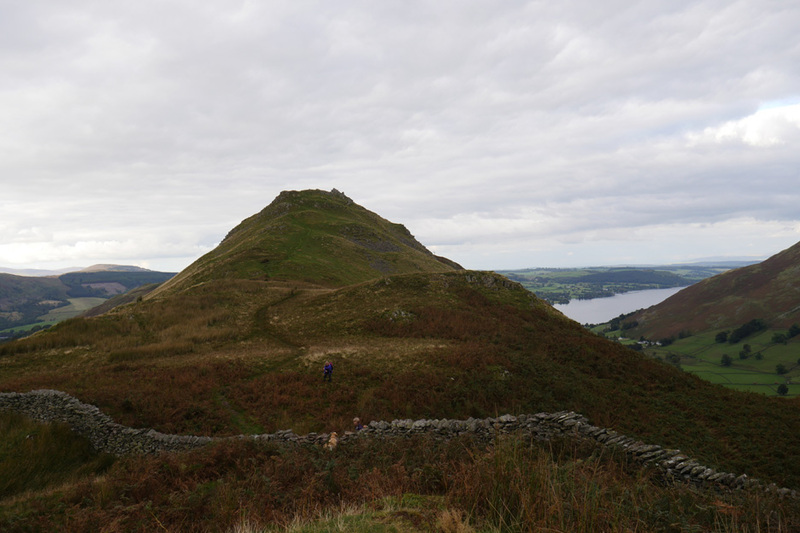 Hallin Fell, seen in its entirety now that we are gaining height. 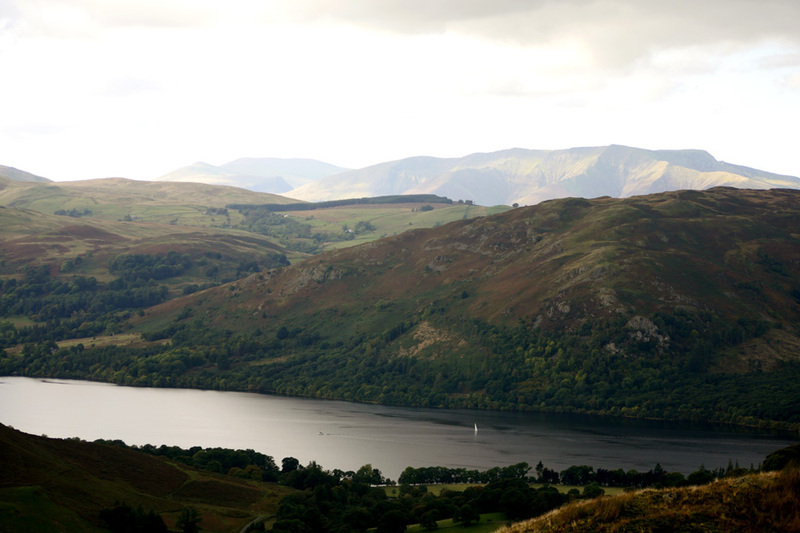 The two stretches of water either side of the fell are in fact two parts of the same Ullswater lake. 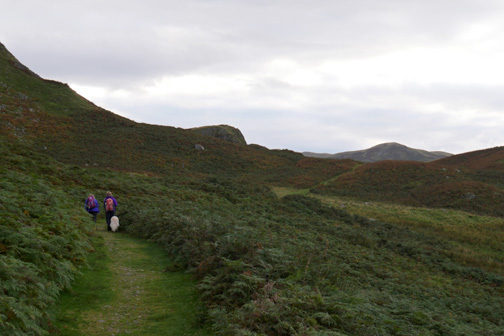 The climb is a series of steep sections with the occasional small crags to allow one to stop for . . . conversation. 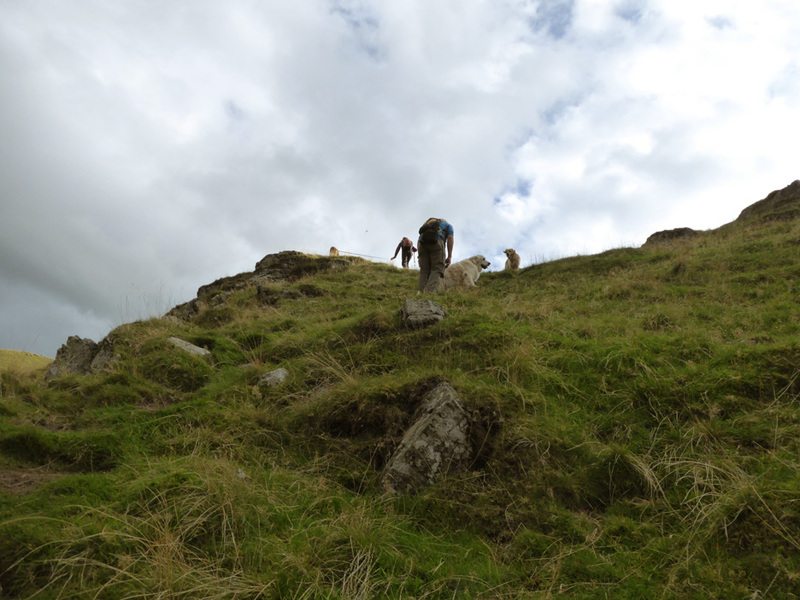 On the top of this section of the climb is a smaller cairn, just to give encouragement for the final push to the summit. 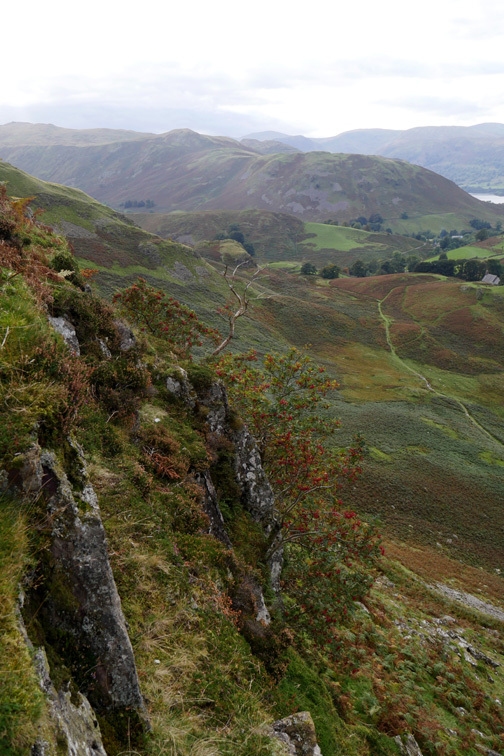 and the summit ridge of High Street above our summit to the left. 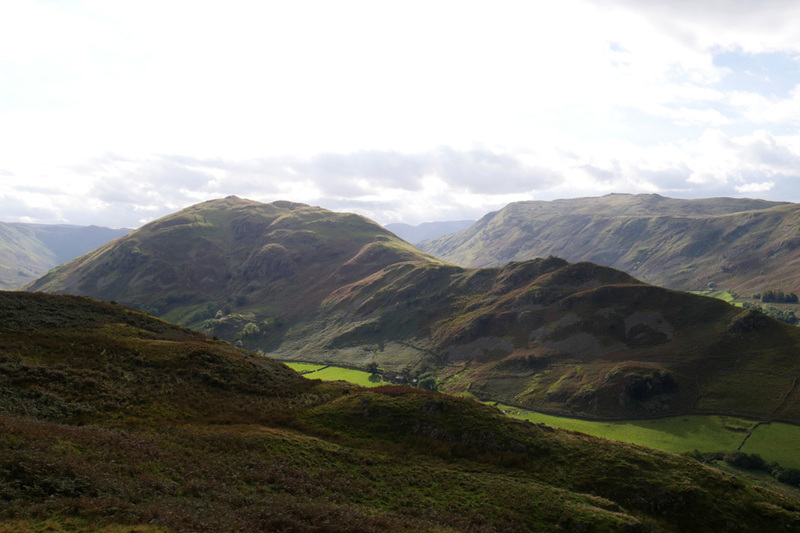 Closer at hand, Beda Fell and the rich green agricultural fields of lower Bannerdale. Through the gap a sailing boat can be seen, sailing before the wind, heading presumably for Glenridding. 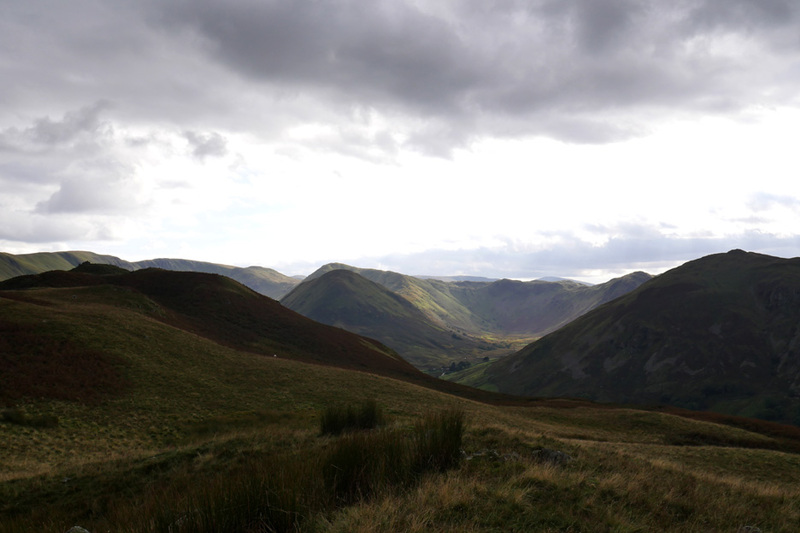 Behind are the high summits of the Blencathra and Skiddaw fells. 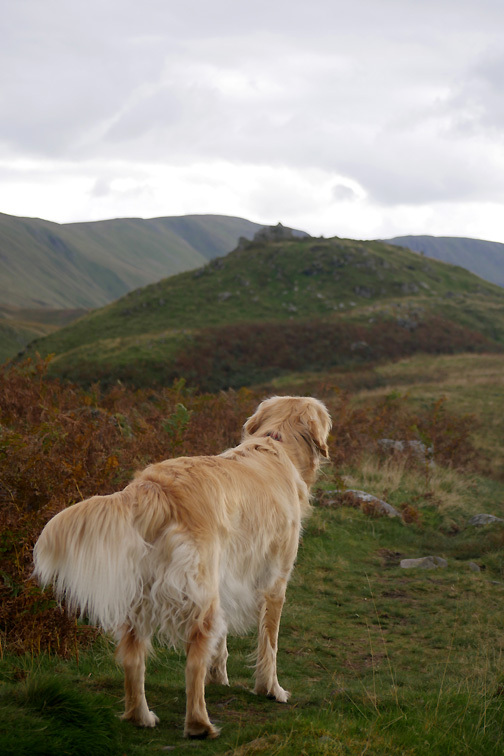 Dylan heads out towards the true summit of Steel Knotts . . .
. . . Harry will follow once he has checked out the various enticing smells. Pikeawassa / Steel Knotts summit . . . last time we were here was 2008 . . . doesn't time fly. 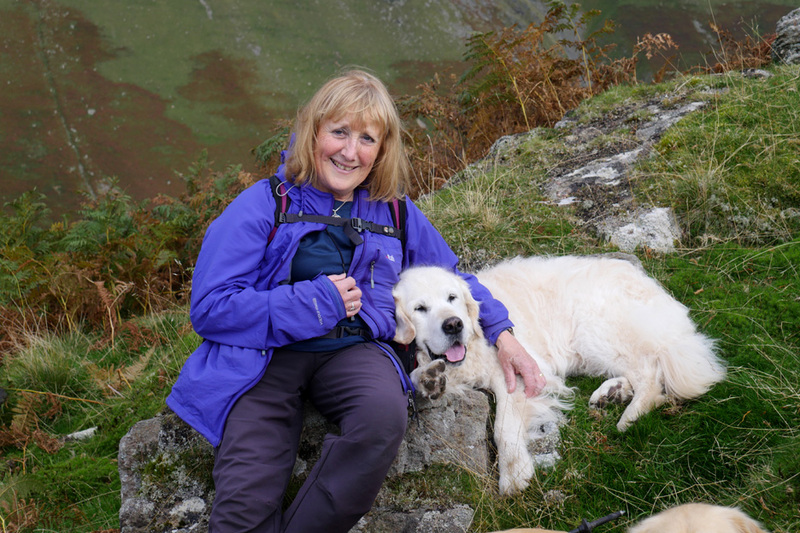 Ann claims the summit too. The cloud has spread across the sky now and the sharpness has gone from the colours. 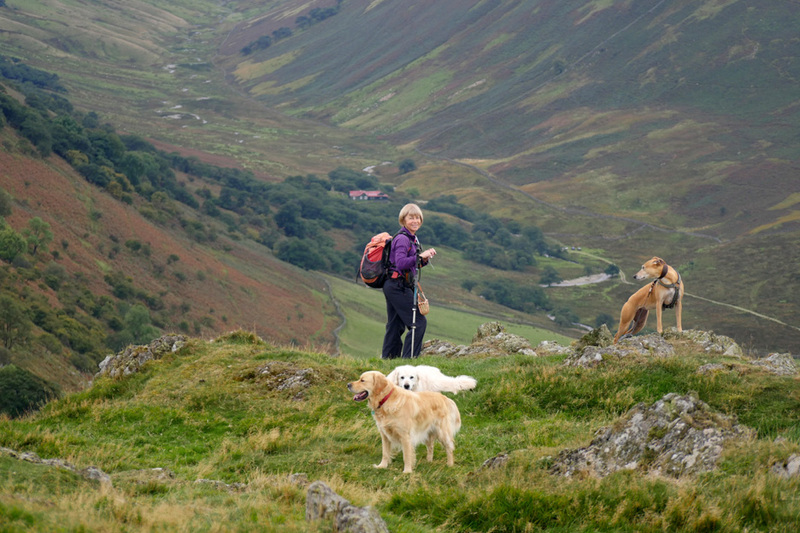 From further along the ridge we have a closer view of The Nab. If we listened carefully we heard the occasionally bellowing from the 'deer rut' in the distant valley. 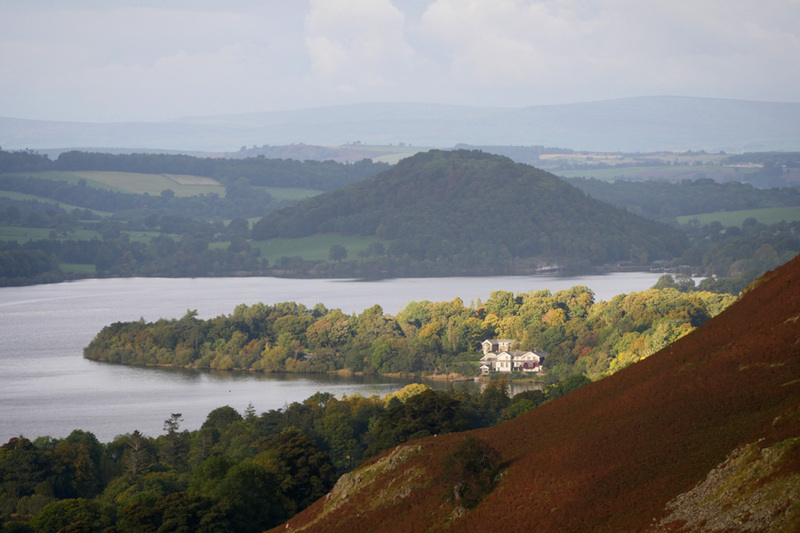 and made famous by the yellow Earl, Lord Lonsdale when it was his base for deer stalking. You mean to say everyone managed to look at the camera at the same time ! 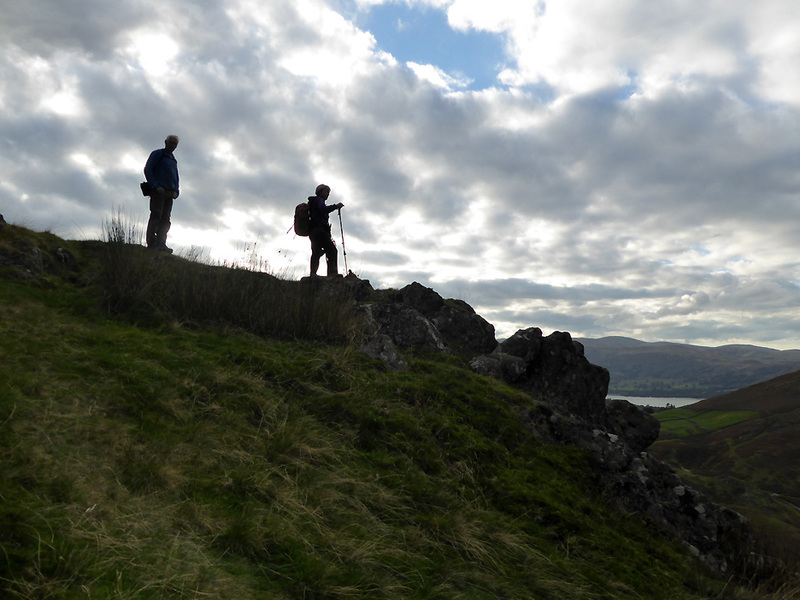 There are a few gaps appearing in the high cloud as Ann takes this silhouette of Jo and myself. so we decided to turn back and head for the car. 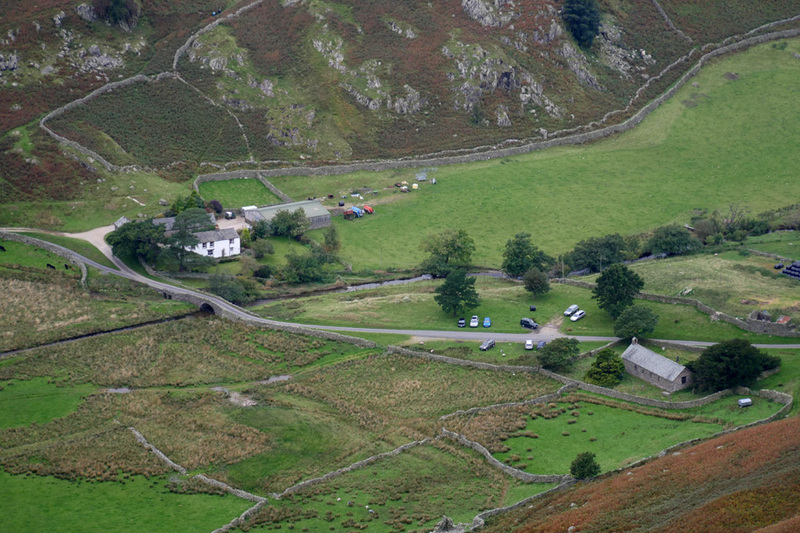 One possible route was to descend to the old Matterdale Church below. 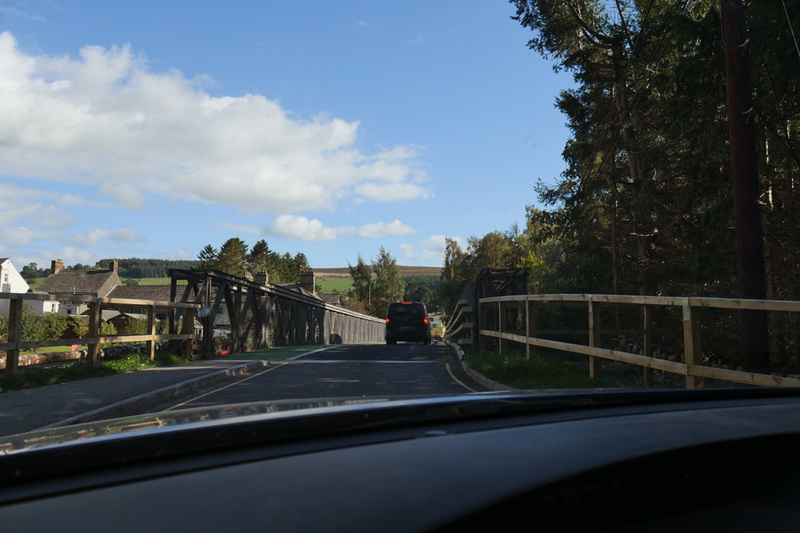 with the intention of descending by the other spur, Steel End. 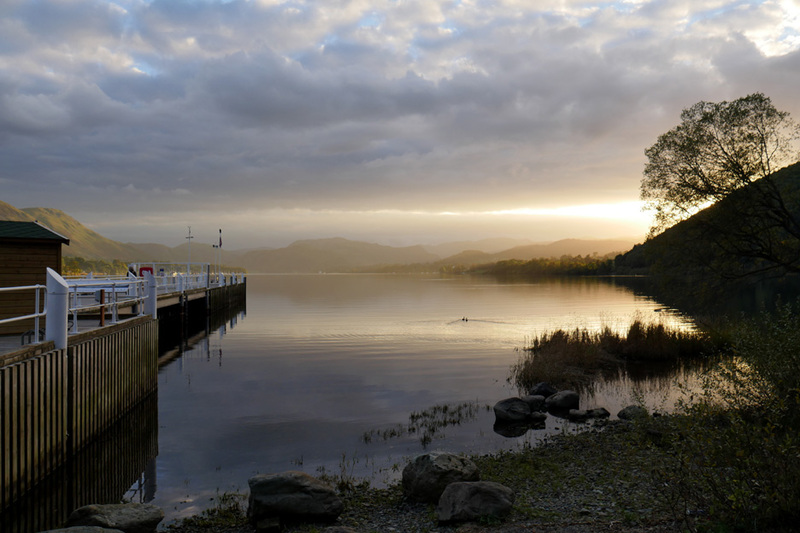 The high cloud has passed over and it's getting generally lighter again. 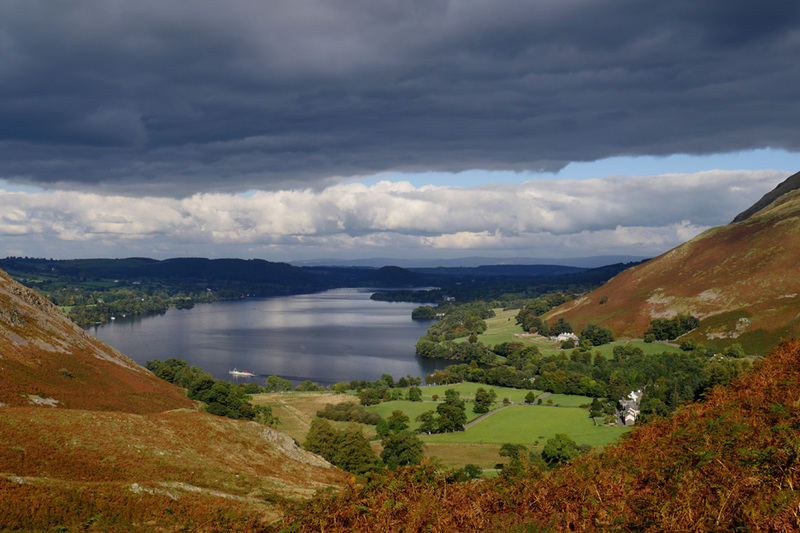 One of those increasing gaps in the cloud allows a shaft of sunlight to illuminate Sharrow Bay and its famous hotel. 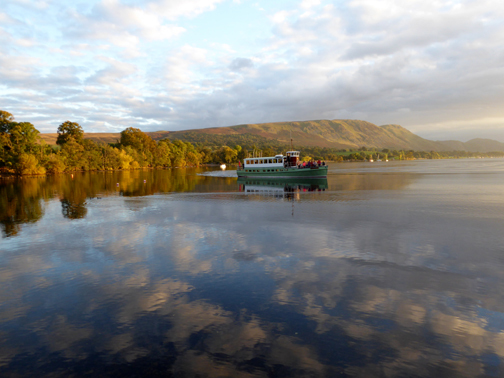 The Western Belle, one of the smaller of the Ullswater fleet, is heading down close to the opposite shore. 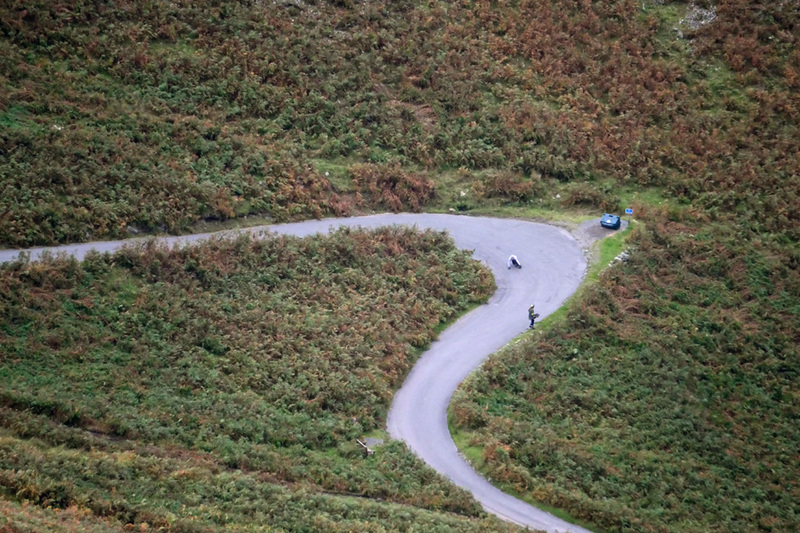 We spent a few minutes enjoying the antics of a few lads skateboarding down the Martindale hairpins. A colourful Rowan clings to the rocky slope. 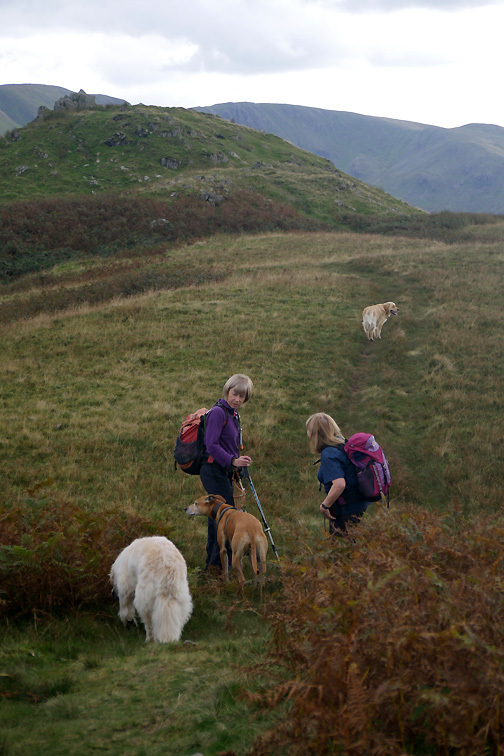 The girls contemplate the next section of the descent. Harry chills out for a few moments as he waits for me to catch up. 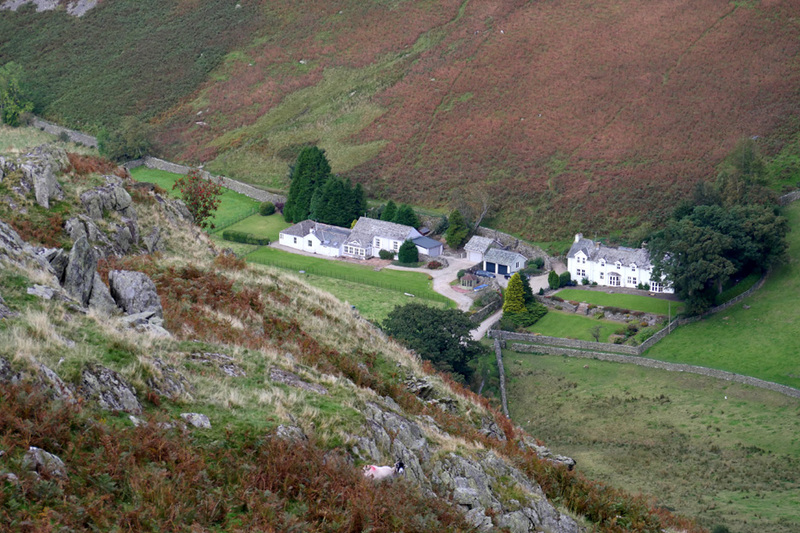 The group of properties known as Mellguards makes up a fair percentage of the hamlet of Howtown. 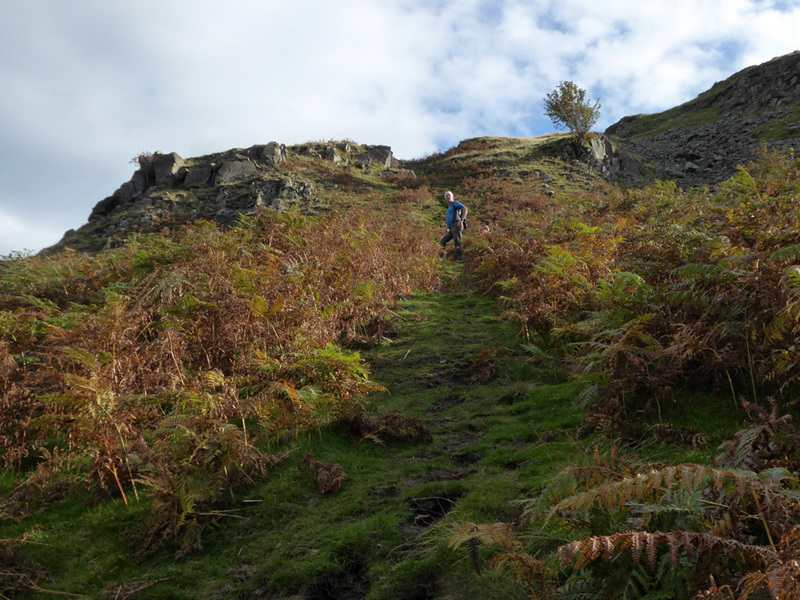 The steep descent, like our route up the other spur wass slightly damp and slippery in places due to surface water. 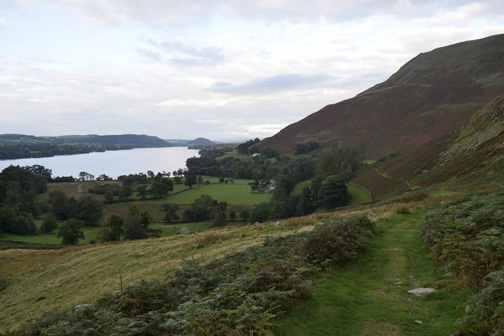 In general terms though, it is a simple descent with lovely views down the lake. From Steel End it is a straight forward half mile walk . . .
. . . back up to the hause above the Church where we started. 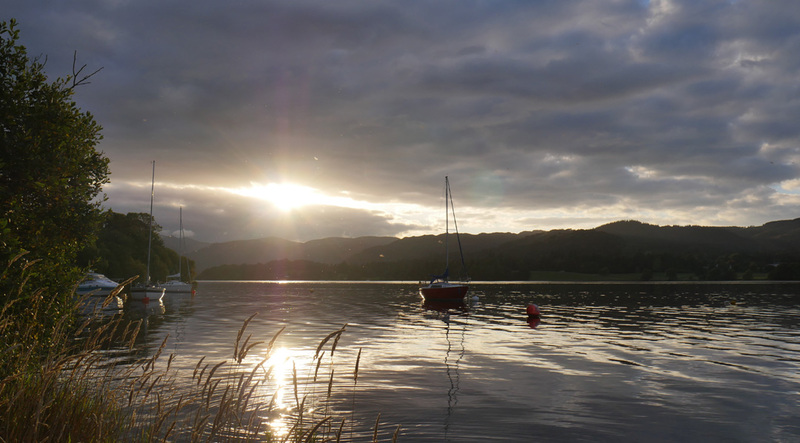 On the way back from Howtown the sun appeared from below the clouds and we stopped by the lake to enjoy the spectacle. 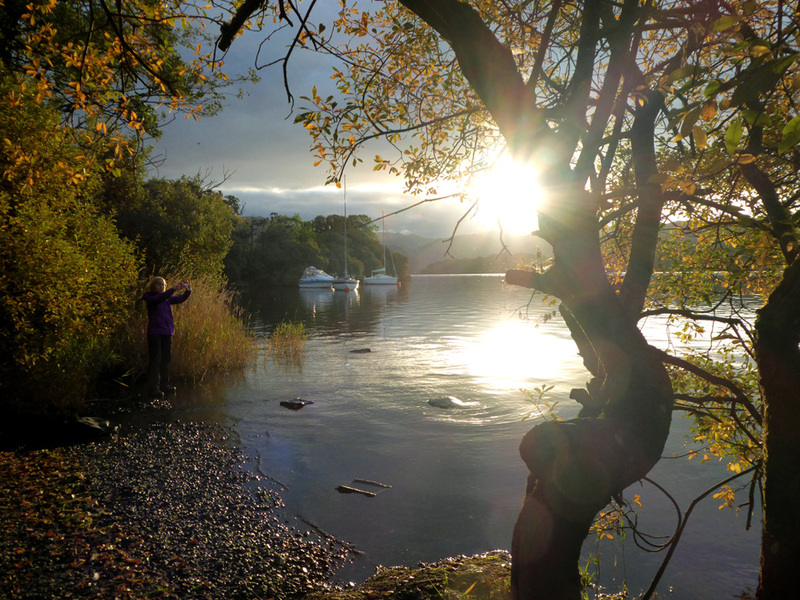 Photographer Jo and a few of the boats moored in the shelter of Sharrow Bay as the sun bursts through. 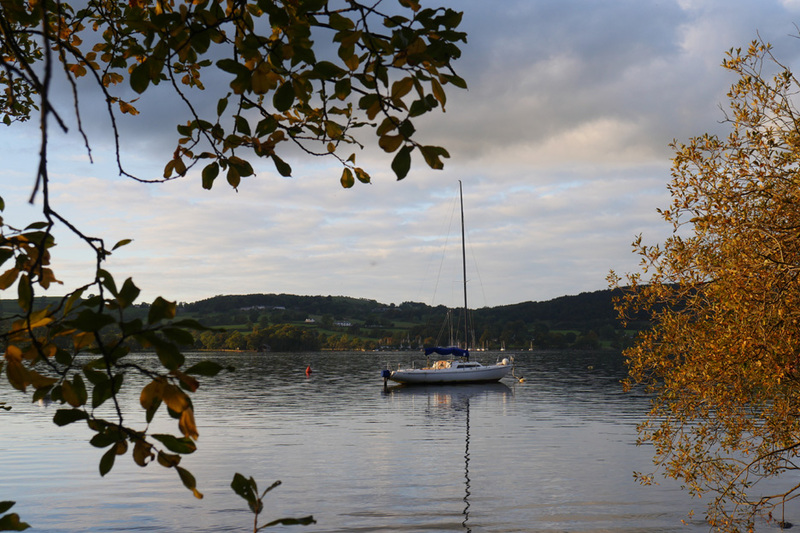 The wind has dropped and the surface of the lake is reflecting the sunlight and the boats. 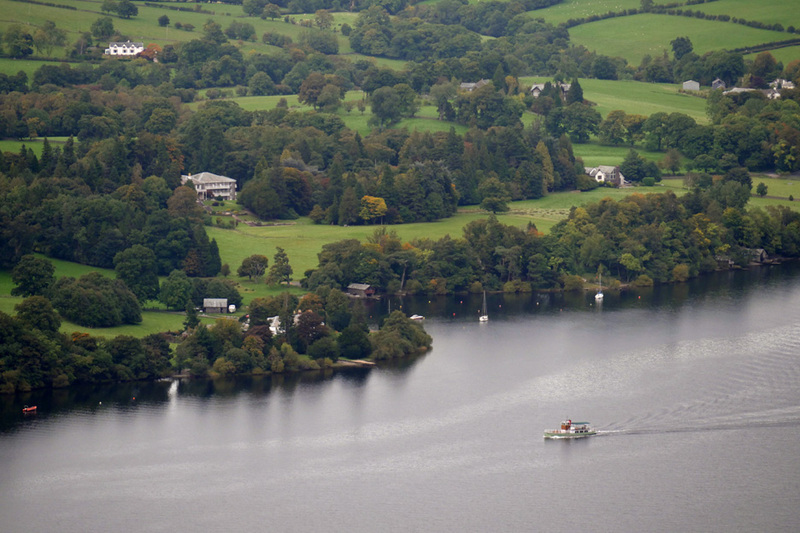 Sharrow Bay Hotel through the trees next to the road. 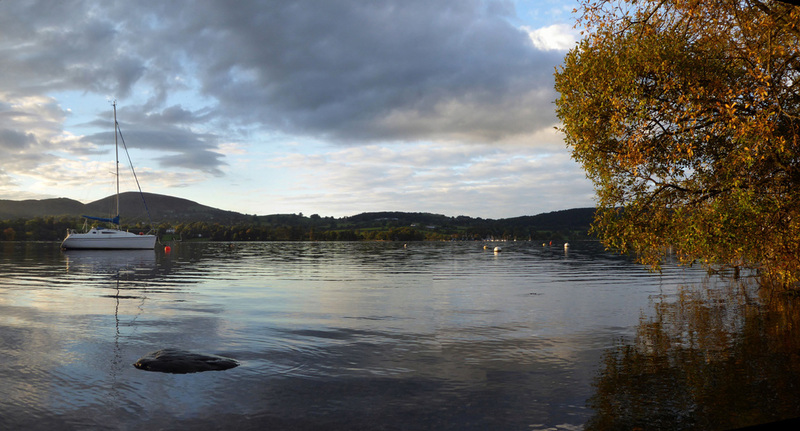 A wider view directly across the lake . 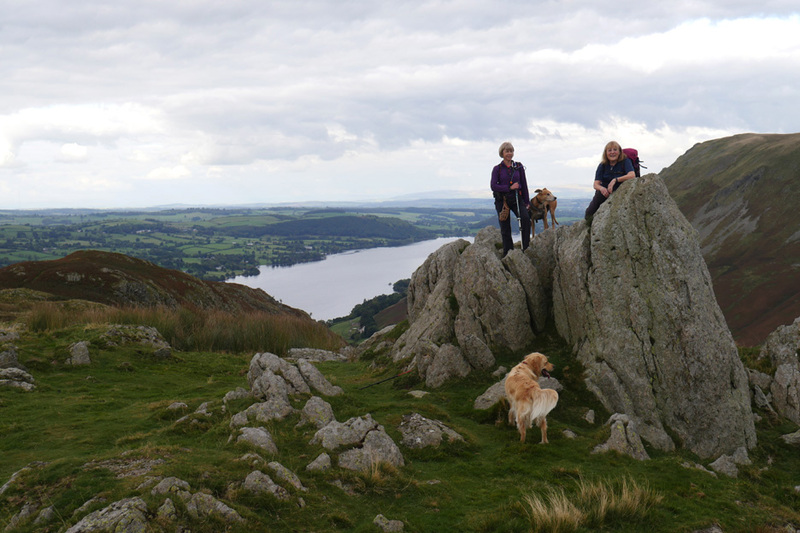 . . with Little Mell Fell behind the cruising yacht. 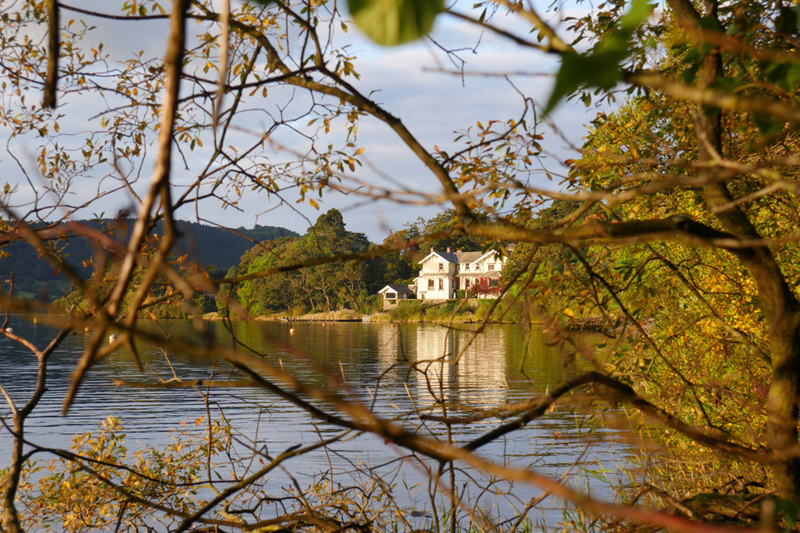 Autumn colours complemented by late afternoon sunshine. 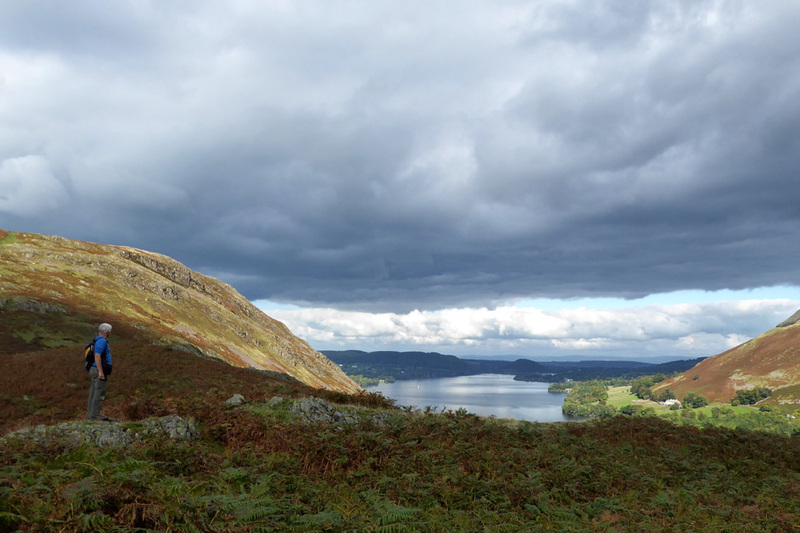 We were right leaving the fell when we did otherwise we would have missed these lovely views. 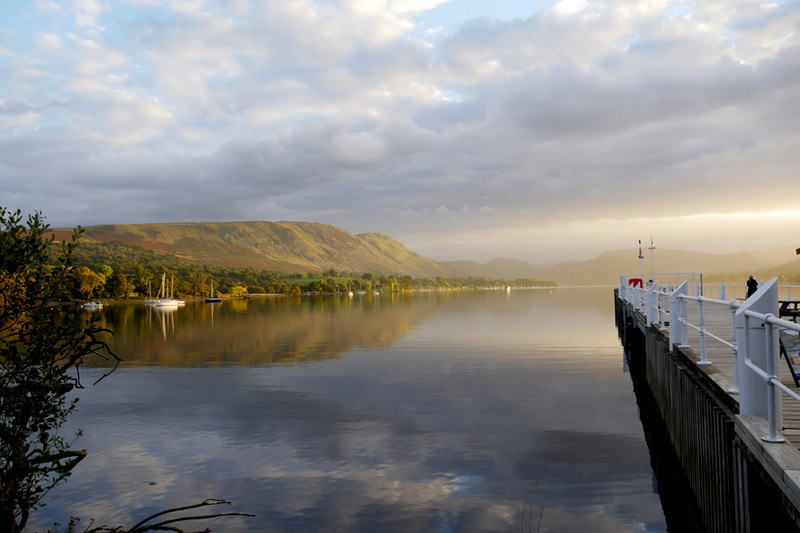 Back at Pooley Bridge Pier the colours and reflections continue to delight. The contrast is heightened as I walk round the other side into the trees next to the road. 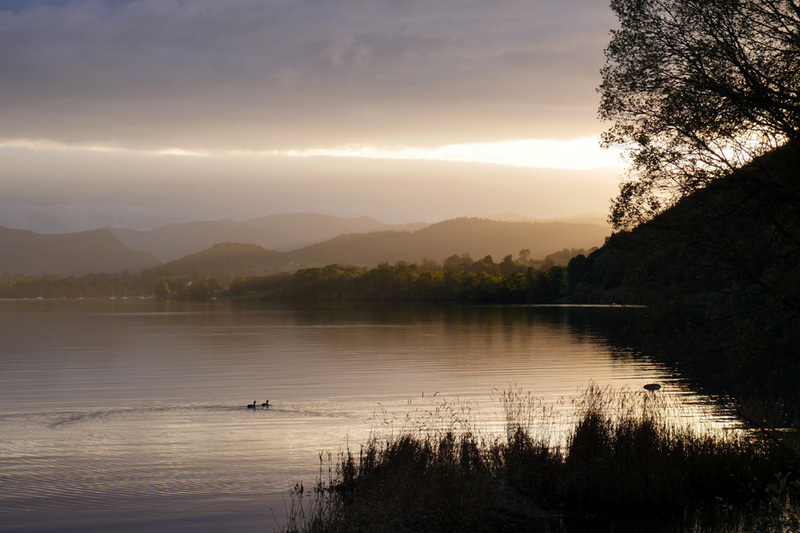 Two small waterfowl are the only things that ruffle the calm waters. Almost sepia in effect . . . but these were the true colours this evening. 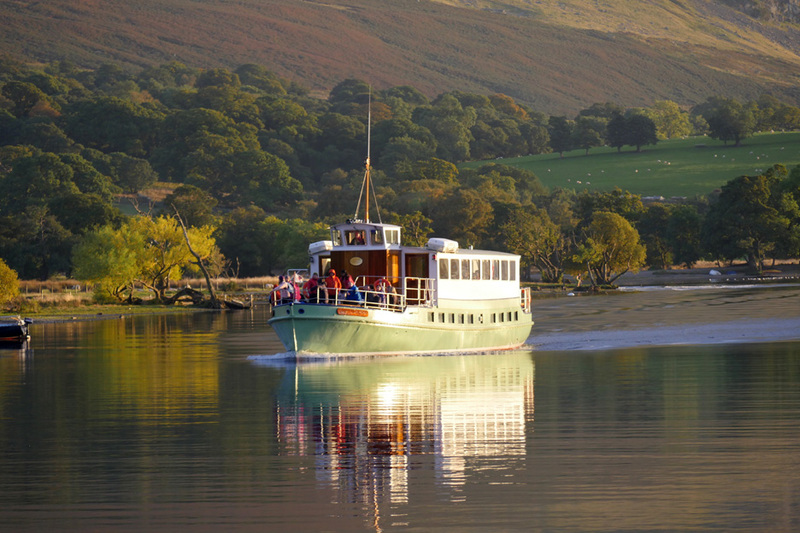 The Lady Wakefield completes one of her last journeys of the day. She starts to turn at the foot of the lake . . .
. . . cutting through the cloud reflections. 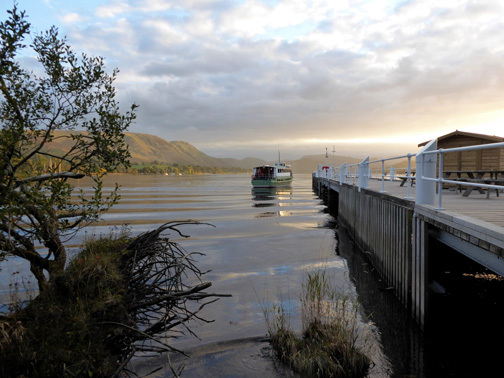 Ready with the mooring ropes . . .
. . . try not to bump the pier as you come alongside ! 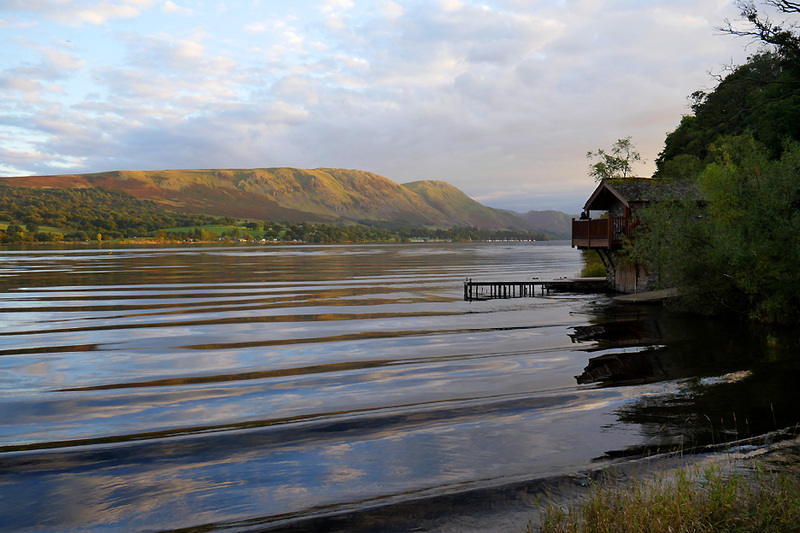 just as the bow wave from the Lady Wakefield reaches the famous boathouse by the edge of the lake. This site best viewed with . . . a nice meal booked at the Brackenrigg in an hour or so.